This is how I make my prototypes, quick and not well finished. So feel free to improve. 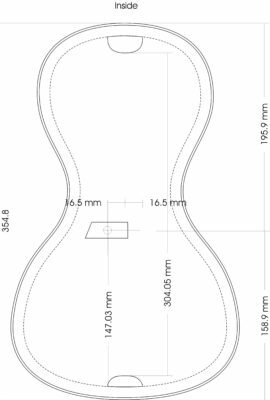 Top and back have an extra 1,5 mm around the circumference. ( for placement see rim on the inside) 25 mm Ø. It is not included as a hole in the file, so there is room for changes and experiments. The file does not provide the holes for the keys and dowels. I use two dowels to match the halfs. 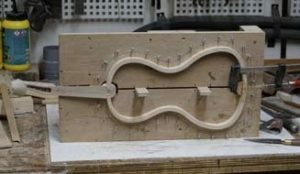 Rubber bands are used for clamping. 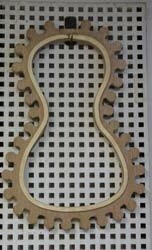 I have used that file just to mill 4 pieces of 22mm plywood an made the Forms from those. Make two strips of Cieba wet (not dripping wet) and press them together in the form. The final height is 32 mm. Variations are possible. The same Form file was used to make the assembly rig. Here neck, ribs, and bottom block are glued. I use it also to align and glue the top. This gives you the shape of the body with blobs on the side for rubber bands or clamps. Make some room for the neck in the top clamp. 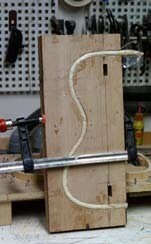 I used adhesive weather-strip on both clamps to protect the wood. I use both clamps to glue the back on. After that it is sanding and finishing. 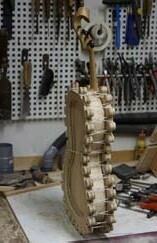 Top nut and back-saddle are hand made . The fingerboard is glued in place .